I had a craving for a burger, and not just any burger… I wanted a ginormous double patty, cheddar cheese, jalapenos, and the works. What a better place to go than Red Robin? We were seated instantly, as if they knew that we were arriving. The waiter, a tall portly fellow with wavy red hair, promptly brought us sodas and took our order. I opened their menu and scanned it for the largest burger… my conscience had set in; I was on a diet. I settled with the lettuce-wrapped salmon sandwich, hoping that it would satisfy my burger appetite. The food arrived promptly, but wait… my sandwich had bread buns and it wasn’t lettuce wrapped. The waiter took it back to the kitchen, he came back immediately with soda refills and told us that they were remaking my sandwich. “You guys are going to throw it away?” “Ya, sorry sir, it’s our policy to make everything right. It’s put at the top of the food queue so it’ll be out in a few minutes.” Just as he was finishing telling me this, the manager brought the sandwich out and apologized. I didn’t care if they took the sandwich back and pulled the buns off and put the lettuce on, but they didn’t. They wanted to maximize my dining experience. This waiter could do no wrong. I left him \$10 on a \$40 ticket; I felt great about it afterwards. The next evening my burger craving could not be subdued. My inner fat-child was screaming for a burger. Despite my exquisite dining experience at Red Robin, I felt it was too early to return. I always enjoyed the burgers at Applebees and decided that would suffice. We arrived and the place was crowded on a late Sunday evening. The wait was 20 minutes, but the hostess informed us that we could sit at the bar and order immediately. As luck would have it, there were two seats at the end of the bar! Applebees must have also understood my desire for a burger. The bartender, a friendly attractive girl, was clearly flustered from the overwhelming amount of people. She handed us menus and took about 10 minutes to take our order. “I’ll have the Cowboy burger!” I exclaimed. “Pink or no pink?” I always thought that restaurants didn’t give that option, but I have an irrational fear of food poisoning, so I responded “No pink, please.” She was kind enough to bring out some free chips and salsa, she was clearly trying to make the experience as best as possible given her limited resources. Fortunately a manager came to the bar to help as well. The food finally had arrived. My mouth watered. I took a big bite of the burger, and disappointedly saw that the inside of the burger was very pink. I pointed this out to the manager. He apologized. He came back with the burger and told me that they fixed it and proudly told me that it was temperature tested. I looked at the burger and noticed it was the one I had bitten into. I’m not one that likes to waste food, so I didn’t care too much. Despite the burger tasting good and my burger craving had been satisfied, something was missing. You see, I view dining as an experience. 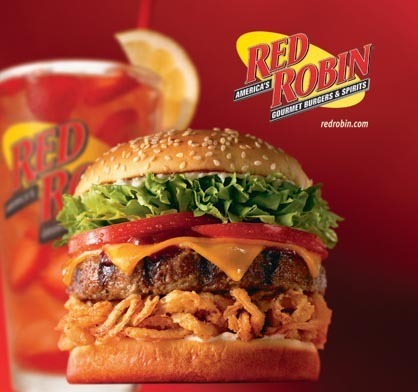 Red Robin dazzled me from start to finish. Applebees was just average. Where do you think I’ll go next time for American-style burger yumminess? Bonus: a great story about Olive Garden throwing away leftovers that a patron forgot.